This stunning off-white Alfa Romeo 6C 1750 has been no stranger to stealing the show at various concours events around the world for more than 80 years. It was built specifically for the 1931 Concorso d’Eleganza Villa d’Este, where it was accompanied by model Josette Pozzo, and together they fittingly took the prized Coppa d’Oro di Villa d’Este trophy. More than seventy years on, the Touring-bodied Alfa Romeo was still winning plaudits, and melting hearts, taking the top trophies at the 2005 Pebble Beach Concours, and upon its return to Villa d’Este in 2007. The epic Alfa has yet to set wheel on British soil, but thankfully this will finally be rectified when the striking Flying Star travels from the USA to the UK specifically for the 2014 Concours of Elegance at Hampton Court Palace (5-7 September), where it will be displayed in the Grand Fountain Gardens as one of 60 exceptional star concours cars, accompanied by another 700 rare and fine automobiles. 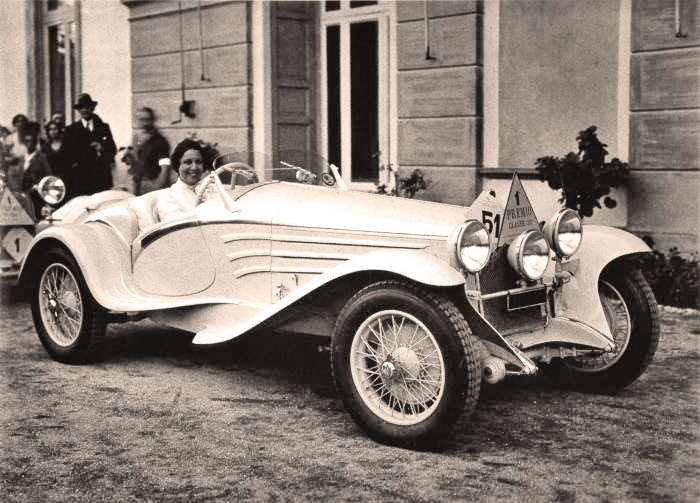 Bodied by Touring in 1931, the distinctive Flying Star was one of a number of 6C 1750s coachbuilt by this talented Milanese design house. However, few wore this dramatic swooping body, with a strong accent line running the length of the low-slung body. The white external coachwork and wheels are complimented by an all-white interior, contrasting with a nickel-plated black dashboard to breathtaking effect, making this Alfa Romeo a must see for any true car enthusiast, as it makes its debut appearance in the UK.